This post has been in my drafts since September! Thought it was finally time I posted it! 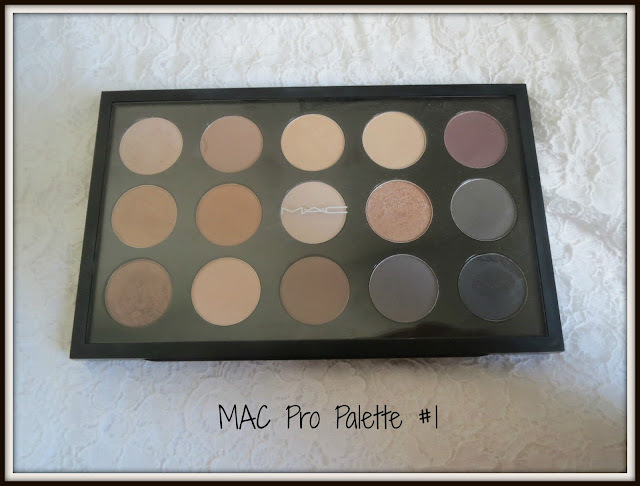 Here's my first (of 3) 15 pan Mac palettes-and the one I reach for most days. It's filled with my choice of mainly neutral shades, perfect for every day. I personally prefer to buy the inserts to keep the shadows evenly spaced and to make it easy to change them around rather than gluing them into the empty pan. I am also the master of de-potting MAC shadows now which I did a post on here. PHLOOF is the shade I reach for the most-it's a beautiful cool toned iridescent white with a hint of pink. It has a frost finish and applies smoothly and evenly. For work I often wear this all over the lid with either sable or blackberry blended out at the outer corner and crease. It always makes my eyes look brighter and me look more awake! It's also a great inner corner highlight and a brow bone highlight if you like a non matte highlight. KID is an orange toned beige with a matte finish that really brings out the colour in my green eyes. Looks great in the crease. DAZZLE LIGHT is a gold toned neutral with a frost finish. The pigmentation is not great on this one even though it is very pretty. I tend to use it as a brow highlighter if I am wearing a brown smokey eye for the evening. BRULE is a creamy beige with a matte satin finish. Good pigmentation and great all over the lid or as a brow highlight. BLACKBERRY is a burgundy plum matte shade. 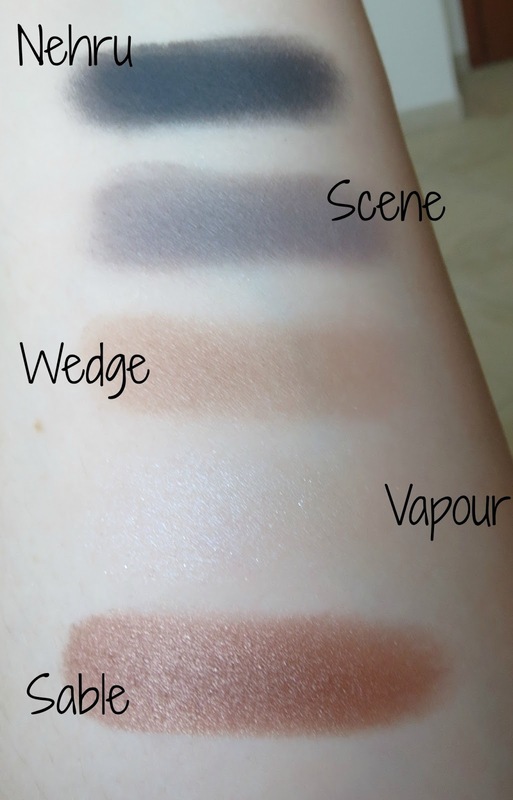 It's really easy to blend out and I use it mainly in the crease and outer corner. It's buildable as well. GRAIN is a good all over lid colour. It has slight shimmer and is a golden beige with a cool undertone. ARENA looks quite dull in the pan but is actually a beautiful peach toned beige with slight shimmer. It applies smoothly and easily. BLANC TYPE has quite poor colour pay off. It's a matte beige. HONEY LUST is described by MAC as a bronze dipped peach. It's quite glitzy and almost like a pigment pressed into a pan. It looks gritty in the pan but the pigmentation is great and it applies smoothly but there is some fallout from the glitter. Not only does this look great blended with darker browns but also with greens as well like Club. PRINT is a mid grey with slight shimmer even though it applies pretty much matte. It's a bit easier to use than carbon for a smoky eye. Blackberry over the lid with print on the outer corner looks great. SABLE is possibly my all time favourite MAC shade. It's a plum tinged bronze with complex shimmer in the light and looks amazing in the crease with Phloof, Arena or Brule or all over the lid with Mulch or Club in the crease. It is amazing. If you don't own it, buy it! VAPOUR is a peachy pink with violet pearl. 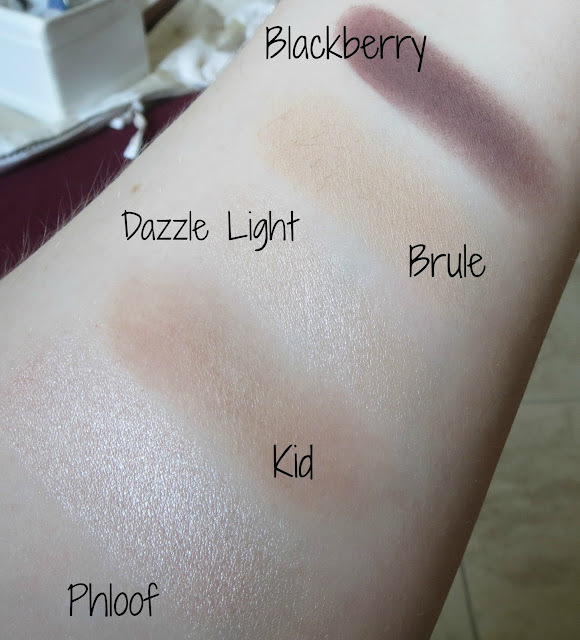 The colour pay off again isn't great on this shadow and it's not one I reach for often. WEDGE is somewhat similar to Kid but runs very slightly more taupe. 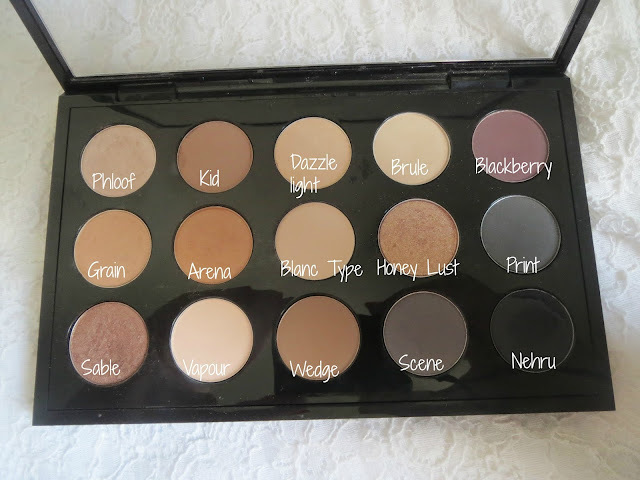 I am not sure why I don't use this more often as it's a great crease colour for a neutral every day eye. The texture of Wedge is not as smooth as Kid but it's still fairly easy to work with. SCENE is a smokey blue toned grey with a satin finish. Best applied over a primer for the best colour payoff. NEHRU is a darker grey with a matte finish. It does have a hint of blue to it as well and works well with other blue and grey shadows. This one also blends really nicely for a dark colour. I'll try and post my second MAC palette asap. 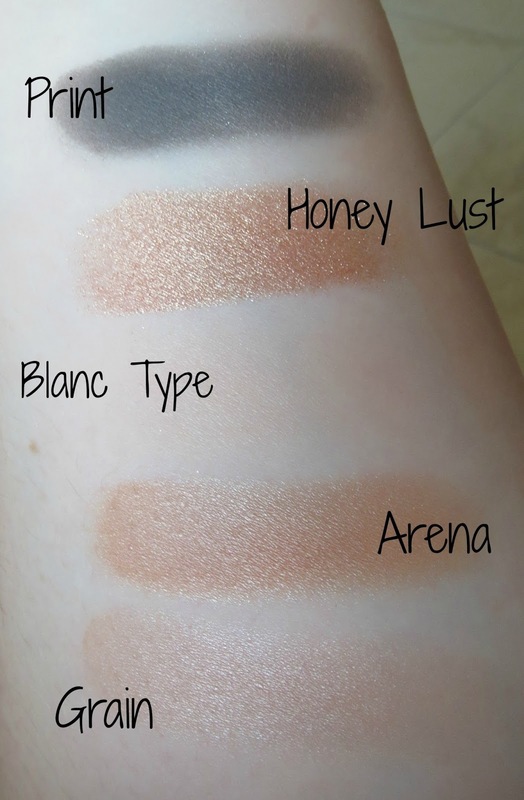 Let me know if you own and love any of these shades.